Police in Pakistan have arrested five men, including an alleged suicide bomber, on charges of planning to attack Shia processions in Karachi. The men were arrested in raids on Friday night, the day before the religious ceremonies of Ashura. Hundreds of thousands of people participate in Ashura processions throughout Pakistan. Ashura, marking the assassination of the Prophet Muhammad's grandson, is commemorated across the Muslim world. In Pakistan, the ancient commemoration can often turn into modern tragedy as Sunni extremists use the public event to carry out terror attacks. 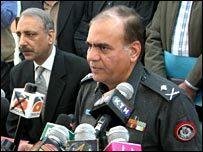 "The suspects have acknowledged, after initial interrogations, that they planned to attack processions on the 9th and 10th of Muharram [19 and 20 January] with grenades and suicide attack," Azher Farooqi, police chief of Sindh province, said. "They also planned to attack army installations in the city, and intended to use cyanide to poison the sabeels." Sabeels are refreshment stands, with juices and water, available to mourners in the Ashura processions. This is the first time that police in Pakistan have recovered cyanide suspected to be meant for terror use. As well as cyanide, the police also recovered 6kg of explosive materials, several grenades and small arms. Mr Farooqi said that the arrested men were trained at a militant camp near the town of Mir Ali in North Waziristan. According to him, the arrested leader of the alleged terror cell, Mohammad Ejaz, was an expert in bomb-making and in the construction of explosive jackets for suicide bombers. The Sindh police chief said Mr Ejaz had previously fought in Afghanistan and was still in touch with the militia of Maulana Jalaluddin Haqqani', one of the main Taleban commanders fighting Nato forces in Afghanistan. Mr Haqqani is said to operate out of Waziristan. In a separate development, Mr Farooqi announced, three men had also been arrested in the nearby city of Hyderabad on similar suspicions. However, he said the men were as yet only being questioned and had not been charged.